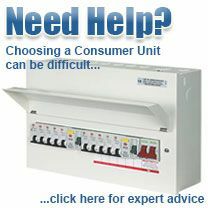 Home > Help > What is an MCB and how does it work? 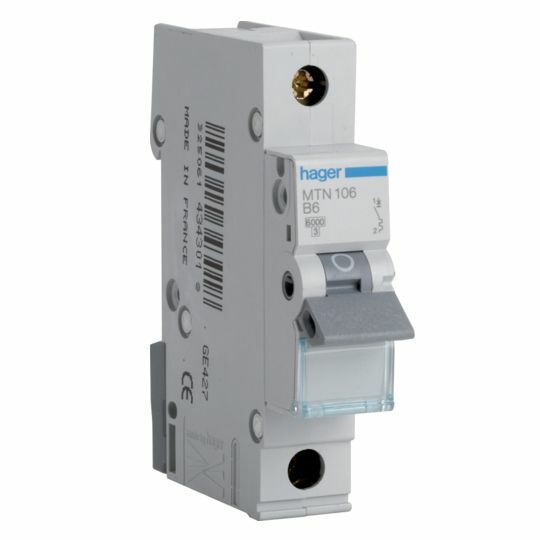 A Miniature Circuit Breaker is an electromechanical device designed to protect an electric circuit from over-current - A term to describe an electrical fault caused by either overload or short circuit. Back in the day we protected against over-current by using fuse wire (indeed, we used to sell it!). The principle was fairly simple - an over-current would quite literally, 'blow' the fuse wire by rapidly heating and melting it, thus breaking the electrical connection and in doing so, protected the rest of the electrical circuit. MCBs improve on this functionality as they are usually not destroyed during over-current so are reusable. They are also much easier to use, offering the convenience of 'on/off switching' for circuit isolation and since the conductor is housed within a plastic casing, they are much safer to use and operate. It is important to note that MCBs do not protect humans against electrical shock caused by 'earth leakage'. This service is provided by RCDs and RCBOs. Overload occurs when too many appliances are put on one circuit and draw more electrical current than that circuit and cable are designed to take. This could occur in the kitchen, for example when the kettle, dishwasher, electric hob, microwave and blender are all in use simultaneously. The MCB on this circuit cuts power thus preventing overheating and fire in the cable and terminals. Short Circuit is the result of a fault somewhere in the electrical circuit or appliance and is potentially much more dangerous than overload as the scale and speed of over current is in a different order of magnitude. It occurs when there is a direct connection between the live and neutral conductors. Without the resistance provided by the normal circuit integrity, electrical current rushes around the circuit in a loop and multiplies the amperage by many thousand times in just milliseconds. MCBs used in domestic installations are typically rated at 6kA or 6000 amps. The relationship between normal voltage (240v) and typical domestic appliance power ratings mean that the over-current caused by short circuit should not exceed 6000 amps. In commercial and industrial situations however, using 415v and large machinery, it is necessary to use 10kA rated MCBs. These ratings signify the maximum Prospective Fault Current (PFC) that the MCB can withstand and still operate correctly by disconnecting the circuit. Should the PFC be exceeded, the MCB could fail resulting in the contacts welding shut. As you have now read, an MCB protects against both overload and short circuit. Overload protection is provided by the Bi-metallic strip (number 13 in our diagram). During 'slow' continuous over-current, characteristic to overload, the bimetallic strip is heated by the electrical charge and thus bends, releasing the mechanical latch. 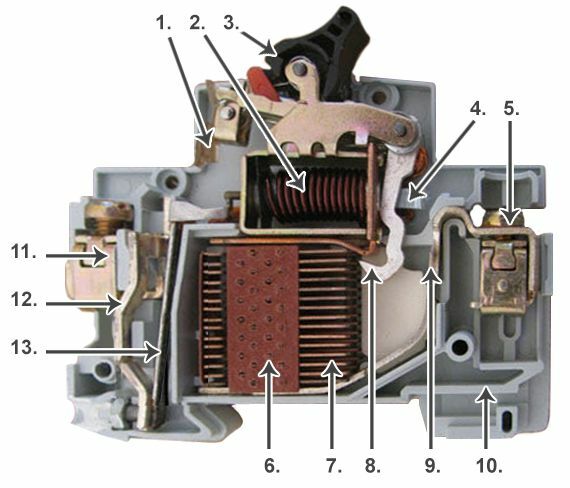 The latch, which is connected to the operating mechanism causes the contacts to open and breaks the circuit. During Short Circuit, the sudden and dramatic rise of electric current causes electro-mechanical displacement of the plunger (4) from the tripping coil or solenoid (2). The plunger strikes the trip lever causing the immediate release of the latch mechanism, opens the contacts and thus breaks the circuit. The 'Tripping Curve' of an MCB allows for real world and sometimes entirely necessary, surges in power. In commercial environments for example, large machines usually require an initial surge of power in excess of their normal running current to overcome the inertia of large motors. This brief surge lasting just seconds, is allowed by the MCB as it is safe to do so for this very short amount of time. Type B MCBs are used in domestic circuit protection where there is little need for surge permission. Any large surge in a domestic environment is likely to be the result of a fault, so the amount of over current allowed is relatively small. B Type MCBs trip between 3 and 5 times full load current, so a 6amp MCB with a B curve will trip between 18a and 30a, depending on how long the over-current lasts, but roughly between 10 and 8 seconds. Type C MCBs trips between 5 and 10 times full load current and are used in commercial and light industrial environments which may feature large fluorescent lighting circuits, transformers and IT equipment such as servers, PCs and printers. Type D MCBs are used in heavy industrial facilities such as factories using large winding motors, X-ray machines or compressors. Due to the large potential surges they trip between 10 and 20 times full load current. A 10 amp D Type MCB therefore trips between 100amps and 200amps. All three types of MCBs provide tripping protection within one tenth of a second. That is to say, once the overload and period have been exceeded, the MCB trips within 0.1 seconds. 10 Amp - large lighting circuits - though these are becoming rarer in domestic settings as technology and trends move towards lower energy lighting sources such as LED. 32 Amp - Ring Final. The technical term for your power circuit or sockets. A two bedroom house for example may have 2 x 32A power circuits to separate upstairs and downstairs sockets. Larger dwellings can have any number of 32 A circuits. 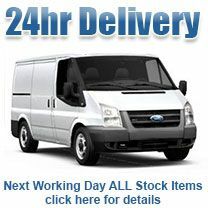 50 Amp - 10kw Electric showers / Hot tubs.